Imagine a home that has red brick walls, a patchwork tile roof, terracotta flooring, wooden doors and windows, a veranda, and is surrounded with ample greenery. Sounds like a place away from the city and in the middle of a village, right? Wrong. Constructed the traditional way by the Centre of Vernacular Architecture Trust (CVAT), these houses are located within the bustling metropolises of Bengaluru and Chennai. "Vernacular Architecture is the use of local materials and traditional techniques for constructing low rise homes. As a principle, this form of architecture involves not using expensive and factory-made material but using old traditional ways of construction and material as much as possible," explains Khalid Rehman, Trustee and Principal architect with CVAT. The style, design and technique of building such homes has a lot to do with skilled labour. 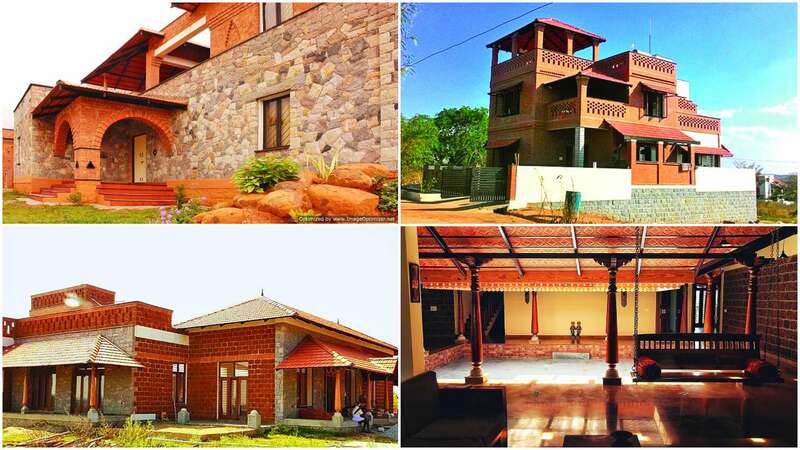 CVAT, founded in 2004, has constructed more than 100 vernacular homes in Bengaluru, Pune, Hyderabad and Palakkad (Kerala), and is currently working on 25 projects in South India. "Skilled labour is the most essential part of this form of architecture. Most of my labourers are from north Karnataka," says Rehman. He cites the example of wire cut bricks used to build such homes, which demand precision in angle while laying them out. Unbelievably, the foundation of the house is made without using any cement. "We try to reduce factory-made products. So we avoid cement and instead use sand, which is naturally available. We make the foundation with just sand and boulders, a technique that you never see in contemporary construction," elucidates Rehman. "We don't use vertical concrete pillars, typically seen in modern buildings. This is also the reason we can't construct homes that are taller than three storeys," he says. Vernacular architecture puts a lot of emphasis on sustainability, on using materials that ensures that the home stays cooler from within without the need for power-intensive air conditioning. "There's something called the fillers roof, that cuts down the use of cement and steel by 30 per cent. Here, terracotta sheets are inserted, which reduces the temperature," elaborates Rehman. Old techniques and sustainability go hand-in-hand in vernacular architecture, with minimal use of plastic and wall paint. Using naturally available materials and reusing construction material as much as possible are its ethos. "We avoid using vitrified tiles or semi vitrified tiles, and instead use Shahabad and other types of natural stone, which are available locally. We can't be completely sustainable, but we try as much as possible," points out Rehman. A lot of importance is given to reusing old wood in order to avoid cutting any more trees. "We use a lot of old pillars, windows and doors from old Chettinad homes that have been demolished," he explains. Much thinking goes into the techniques used to construct homes the vernacular way. Variations depend on location too, as the soil, humidity levels and temperature play a pivotal role. So if it's a place with hot weather, then air vents and modes of cross ventilation are included in the design. Exposed natural walls, natural flooring material, tiled roofs, etc are typical characteristics of this architectural style. Cost wise, constructing a house in the vernacular way is not as expensive as doing it the contemporary way. "For contemporary architecture, there are architects who charge Rs 2,500 per sqft, and others who use Italian marble flooring and wood work, for which they quote Rs 4,000 sqft. We are in a cost bracket of Rs 2,000 to Rs 2,200 per sqft," Rehman reveals. Also it's the client's demands which influences the cost. If a client wants modern marble or a more contemporary interior, then the cost would increase too.